Maybe I was holding out hope that on "God & Guns" LYNYRD SKYNYRD would return to a sound at least reminiscent of its '70s glory days, even with Gary Rossington as the only original surviving member of the storied act. That was probably unrealistic on my part. Even then, I didn't expect a modern country album, which is pretty much the case with "God & Guns". The bigger problem is that it is not exactly a stellar modern country (or country-rock) album either, but I'm certainly no expert in the field. 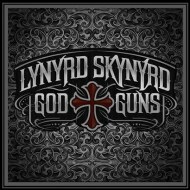 Most would be hard-pressed to call "God & Guns" a southern rock album, even though there are rock elements present on a handful of songs, although not necessarily any more so than the typical countrified rock 'n roll you might see on CMT. In all fairness (and it is not easy being fair when I'm not exactly enamored with country music, even less so the modern variety), "God & Guns" is inclusive of some relatively rockin' and fairly hooky tunes, namely "Still Unbroken", "Little Thing Called You", and the only one that approaches the '70s sound, "Southern Ways", though it is a blatant attempt at recreating a "Sweet Home Alabama" vibe, right down to the piano playing. Even the country-pop chorus of "Simple Life" saves an otherwise hokey-as-hell song. The rest is pretty slim pickings. "Skynyrd Nation" (one of several with a writing credit from ROB ZOMBIE guitarist John 5), "Coming Back for More", and "Storm" are barely mediocre country rock tunes. The swampy/bluesy "Floyd" (featuring guest vocals from Rob Zombie) is more than tolerable, but hardly a homerun. As far as the ballads go, "Gifted Hands" is decent, the title track is at least middling, and "That Ain't My America" is horrendous, especially the right wing lyrics, such as "Now there's kids that can't pray in schools" and "Here's to the women and men, in their hands they hold a bible and a gun / and they ain't afraid of nothing when they're holding either one". Spare me. Truth be told, there is an audience out there for this kind of stuff, but it is not the crossover audience that LYNYRD SKYNYRD commanded with its music during the group's heyday. Whether you dub it "country", "country rock" or, God forbid, "southern rock", it is something just shy of a mediocre affair.